But is it possible to sell effectively without walking into ethical gray areas? Or must an ethical marketer resign himself to using only weak selling techniques to avoid becoming a manipulator? In this discussion, the inevitable debate erupted over what the difference is between persuasion and manipulation. Says one of my companions: "the difference is the intent." While I agree entirely that intent is important, I don't believe it has anything to do with the difference between persuasion and manipulation. Intent will often determine a marketer's choice of techniques. Those with ethical intent are more likely to choose ethical techniques. But there are people who believe that they know what's good for their prospects better than the prospect does. In fact, it's a marketer's job to know who needs their product and why better than their prospects. The problem is, just like communist central planners, some marketers feel they should make decisions for their prospects -- that they should manipulate people for their own good. Good intent becomes their justification for manipulation. So much for intent being the difference. On the flip side, sometimes people who know that their product is bad for people use non-manipulative techniques to sell them. If an ethical technique is effective, they won't shun it just because their intent is evil. If intent isn't the difference, what is? Let's shine some more light on the subject. Once upon a time, there was a successful marketer of paintings. A young man came to him and asked to learn the secret of his success. "The secret is in my marketing light," the successful man replied. "Come with me while I show a painting and see how it works." The two went into the marketer's art gallery and met a client who'd come to look at a painting. The client was already standing in front of the painting, admiring it, but clearly wasn't yet convinced it was worth the price. The marketer turned on a light that illuminated the painting beautifully. He pointed out the artistry in the individual brush strokes, the magnificent choices and mixing of colors, the beauty of the chosen subject and the skill with which it had been rendered. The client, examined each aspect of the painting carefully as the marketer described it. When they'd finished, the sale was made and the buyer went away happy. "See?" said the marketer. "The secret is my marketing light." The young man went his way and set up an art gallery in another town. One day a client came into the gallery. The young man already had his marketing light turned on. He pointed out the many perfections of the painting, the client studied it carefully, and decided to buy. A few days later, the painting was delivered to the buyer. When he unrolled it, to his surprise, he found nothing but a blank canvas. He contacted the young man and complained that he hadn't received the painting he'd been shown. The young man replied that he'd been given the very canvas they'd looked at in the studio. And it was true. It was the very canvas. But there was no painting on it. The difference between the two marketers was their marketing light. The first man used one carefully selected for the way it dispersed light and for it's perfect balance of different colors. The second used a high quality projector to display paintings on blank canvasses. Does your marketing light reveal the truth about the product? Or does it color the product and make it appear to be something different? 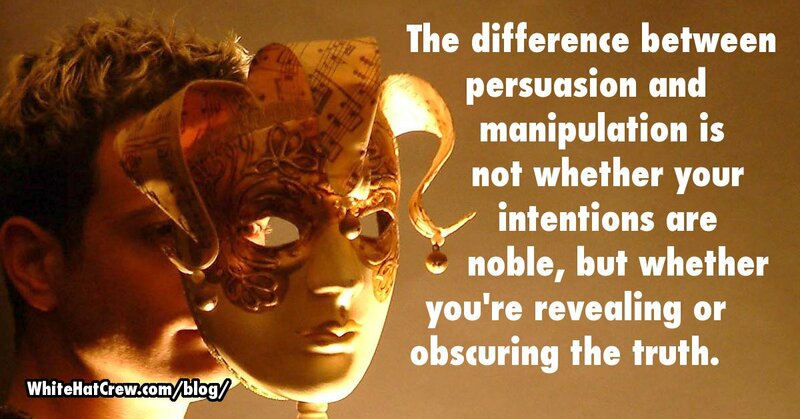 That's the difference between persuasion and manipulation. If your product is exactly what the prospect needs, all you need to do is help them see that as clearly as possible: help them recognize how your product delivers the benefits they desire; show them benefits they didn't even realize were related to your category of product; etc. As long as what your "light" is revealing is truth, there's no manipulation. But if you're shining blue light on a competitor's red product to make it appear black; if you're projecting an image on your product where there is none (false income claims, fake testimonials, describing a lifestyle you've gained by methods unrelated to the product, etc. ); if you're turning off the light to hide the truth -- in short, if you're inducing people to make decisions based on false premises, that's manipulation. One technique that's used to make claims about a product more believable is called "the damning admission." Just before making a claim that you want people to believe, you admit something negative about your product. By demonstrating your willingness to show your product in it's true light, you gain credibility, and the prospect is more likely to believe your positive claim. Of course, this technique can be used either to shine a more perfect light on the truth (to help people accept a true but exceptional claim that would usually be received with skepticism), or to manipulate (to trick people into accepting a false claim). Your intent may guide your decision to use the technique or not, but it's the truth or falsehood of the claim that determines whether it's persuasive or manipulative.